Saint Nektarius was born in Selyvria of Thrace on October 1, 1846. After putting himself through school in Constantinople with much hard labour, he became a monk on Chios in 1876, receiving the monastic name of Lazarus; because of his virtue, a year later he was ordained deacon, receiving the new name of Nektarius. Under the patronage of Patriarch Sophronius of Alexandria, Nektarius went to Athens to study in 1882; completing his theological studies in 1885, he went to Alexandria, where Patriarch Sophronius ordained him priest on March 23, 1886 in the Cathedral of Saint Sabbas, and in August of the same year, in the Church of Saint Nicholas in Cairo, made him Archimandrite. Archimandrite Nektarius showed much zeal both for preaching the word of God, and for the beauty of God's house. He greatly beautified the Church of Saint Nicholas in Cairo, and years later, when Nektarius was in Athens, Saint Nicholas appeared to him in a dream, embracing him and telling him he was going to exalt him very high. On January 15, 1889, in the same Church of Saint Nicholas, Nektarius was consecrated Metropolitan of the Pentapolis in eastern Libya, which was under the jurisdiction of Alexandria. Although Nektarius' swift ascent through the degrees of ecclesiastical office did not affect his modesty and childlike innocence, it aroused the envy of lesser men, who convinced the elderly Sophronius that Nektarius had it in his heart to become Patriarch. Since the people loved Nektarius, the Patriarch was troubled by the slanders. On May 3, 1890, Sophronius relieved Metropolitan Nektarius of his duties; in July of the same year, he commanded Nektarius to leave Egypt. Without seeking to avenge or even to defend himself, the innocent Metropolitan left for Athens, where he found that accusations of immorality had arrived before him. Because his good name had been soiled, he was unable to find a position worthy of a bishop, and in February of 1891 accepted the position of provincial preacher in Euboia; then, in 1894, he was appointed dean of the Rizarios Ecclesiastical School in Athens. Through his eloquent sermons his unwearying labours to educate fitting men for the priesthood, his generous alms deeds despite his own poverty, and the holiness, meekness, and fatherly love that were manifest in him, he became a shining light and a spiritual guide to many. At the request of certain pious women, in 1904 he began the building of his convent of the Holy Trinity on the island of Aegina while yet dean of the Rizarios School; finding later that his presence there was needed, he took up his residence on Aegina in 1908, where he spent the last years of his life, devoting himself to the direction of his convent and to very intense prayer; he was sometimes seen lifted above the ground while rapt in prayer. He became the protector of all Aegina, through his prayers delivering the island from drought, healing the sick, and casting out demons. Here also he endured wicked slanders with singular patience, forgiving his false accusers and not seeking to avenge himself. Although he had already worked wonders in life, an innumerable multitude of miracles have been wrought after his repose in 1920 through his holy relics, which for many years remained incorrupt. 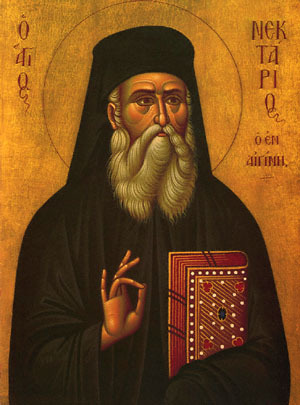 There is hardly a malady that has not been cured through his prayers; but Saint Nektarius is especially renowned for his healings of cancer for sufferers in all parts of the world. In joy, let our hearts praise the latest shining star of the Orthodox, the newly erected rampart of the Church. For, glorified by the work of the Spirit, he abundantly pours forth the grace of healing to those who cry out, "Hail, Father Nektarios". Share the feast of Nektarius the Wonderworker, Metropolitan of Pentapolis with an icon greeting ecard.